When one thinks about global health, there are certain images that come to mind: developing nations with insufficient medical resources to meet their residents’ needs, high rates of infection and parasitic diseases due to the lack of potable water and lack of necessary infrastructure, and disease that we in the United States consider exotic or unusual. There is a certain amount of truth to these images, especially for global health work that takes place in isolated communities. However, it is becoming ever more evident that any efforts toward improving global health must begin to shift their focus away from acute disease and infectious illness and start to pay attention to chronic, non-communicable disease like diabetes high blood pressure (hypertension), heart disease, chronic lung disease, cancer, etc. Last month, the World Health Organization (WHO) held its First Global Ministerial Conference on Healthy Lifestyles and Non-communicable Diseases Control to discuss issues surrounding non-communicable diseases (NCD) in further detail. The WHO notes that nearly 80% of the 36 million global deaths that occur annually occur in low- and middle-income nations, with more than 9 million people dying prematurely before their 60th birthday. As great as this burden is, it expected that by 2030 NCD-related deaths will increase by 50% in South-East Asia, the Middle East, and Africa. Already, NCDs account for 63% of global deaths (36 million of a total of 57 million deaths annually) and are placing enormous burdens on already-stressed health care systems and national budgets. In her opening statement for this meeting, WHO Director-General Dr. Margaret Chan noted much of the increasing burden of NCDs is related to a combination of factors that are familiar to any of us who work in primary care in the United States: obesity, tobacco and alcohol use, lack of nutritious foods, lack of exercise, etc. At the large-scale level, Dr. Chan calls on governments to begin to make changes that can benefit populations: restricting tobacco use and advertising; lowering sodium contents of foods; implementing urban design plans that emphasize walking, cycling and safe places for children to play; and reducing excessive alcohol use. These are important goals, and will be the focus of further discussion at the higher levels of governments across the globe. At the very local level, such as in the communities of Paraiso where we work, the importance of NCDs is evident. We have already noted many of our adult patients who are being treated for hypertension, diabetes, etc. Our organization has moved to focus on bringing sufficient numbers of medications for chronic diseases in order to complement the treatments for infections and acute illnesses that we previously expected. We have also continued to make new diagnoses of hypertension and diabetes every trip to the community. Our new focus on NCDs has complicated our work significantly. Working on short-term medical trips, it is very easy to focus on acute illness: typically, the medications we can provide can effectively address the problem. 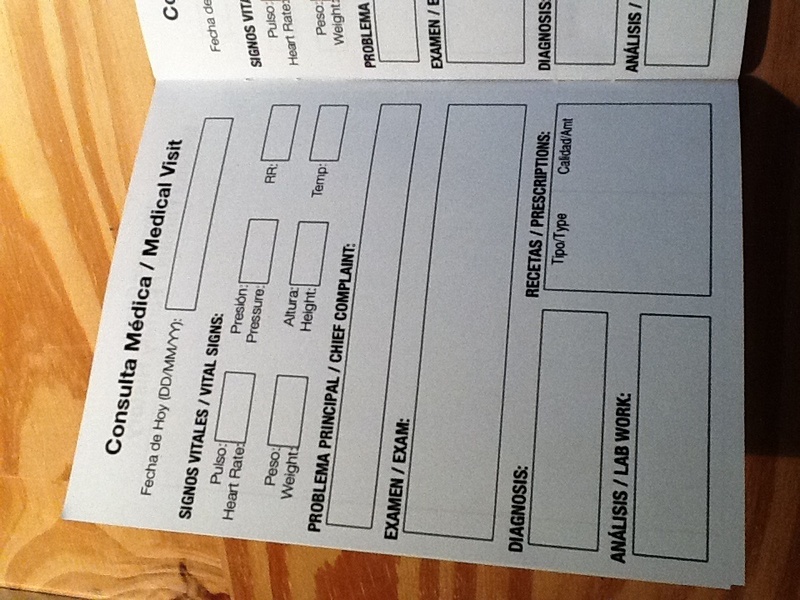 However, working to care for patients with NCDs means bringing enough medicine to last for longer-term treatments, looking to establish ongoing relationships with patients, and attempting to record (and save) a medical history that includes prior medical problems, and document a plan of care that would be available for follow-up care in the future. All of this is a challenge in a community in which people move around with some frequency, literacy and educational levels are often low, and contact with the local health care system (and supplies of affordable medicines) are limited. In order to address these challenges, we are trying something new. Soon-to-be Dr. Matt Imm, who was an undergrad working with our organization in the DR in 2006 and 2007 and who helped establish the Partnership for Ongoing Developmental, Educational, and Medical Outreach Solutions (PODEMOS) at the Ohio State University School of Medicine, presented us with a great opportunity. 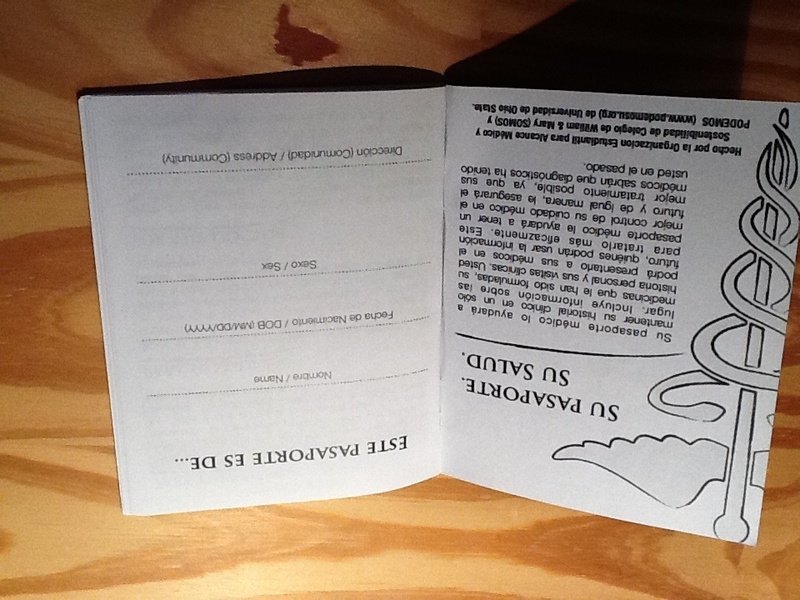 PODEMUS had developed a health passport to facilitate their short-term medical work in which multiple teams would spend time in a community in Honduras over the course of a year but the individuals making up the team might differ each time. 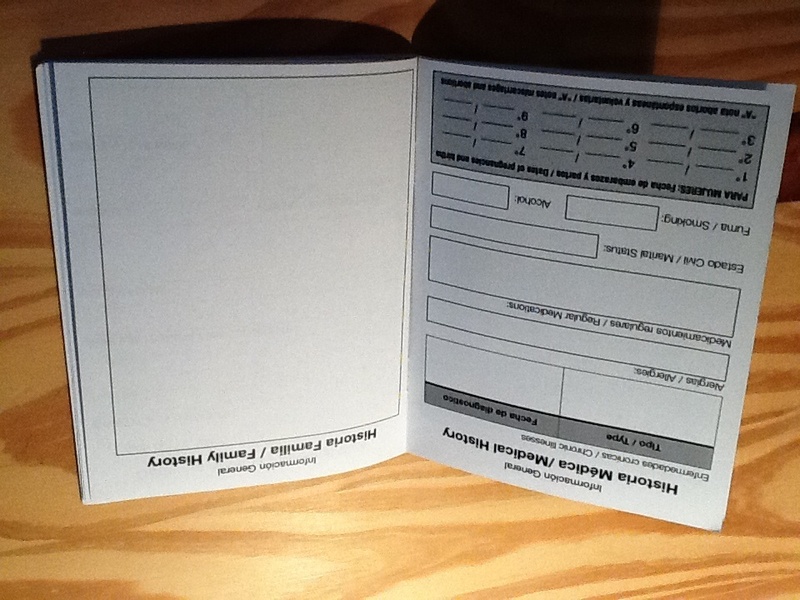 The health passport allows documentation of a patient’s history; provides a space to document each patient’s vital signs and physical exam; and permits documentation of a treatment plan. 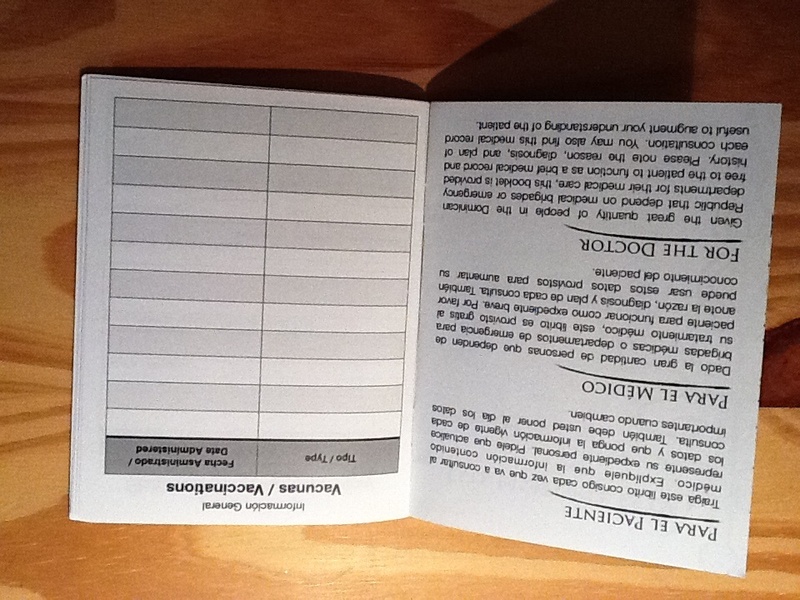 In the interest of privacy, this health passport stays with the patient (not with the international team), and patients are encouraged to present the passport any time they access medical care either locally or through other international teams. Each time the patient sees a healthcare provider, the passport can be reviewed and updated as appropriate and can then be made available to the patient’s next health care provider. In January of this year, we distributed nearly 300 passports. In June, we will see how many patients return with passports for us to review and we will find out how many of these passports and been reviewed and updated by other providers. We also plan on distributing more passports in order to do our part to try and address this issue of NCDs.